"Disaster artist" and creator of the famously bad film 'The Room,' Tommy Wiseau was everything I'd hoped he would be. Even if you’ve never heard of Tommy Wiseau or the movie The Room (2003), you’ve probably heard or read someone quoting this line. It comes at the climax of the protagonist’s monologue, and to those of us constantly parroting the line, it represents the pinnacle of the terrible acting, writing, and directing that makes The Room such a classic. Said acting, writing, and directing were all done by “artist” and walking cartoon character Tommy Wiseau. And I’m not exaggerating here: with his long black hair, bizarre early-00’s fashion choices, vaguely Eastern European accent of undetermined origin, and political cluelessness, Mr. Wiseau could easily have walked out of an episode of Archer or Metalocalypse. I say “Mr. Wiseau,” but we all call him “Tommy.” You see, I’m part of the large and strangely enthusiastic cult following of The Room. I have been since a college friend showed it to me in 2009, and I’m still not quite sure why. The movie’s plot is roughly this: a successful banker, Johnny (Wiseau), maintains his fiancée, Lisa, in idle comfort. In turn, she grows bored and cheats with Johnny’s best friend, Mark. Johnny is torn apart by this revelation and blows his brains out on his birthday. All of his friends cry about what a good guy he was. I don’t know when I got it into my head that I wanted to meet Tommy. Certainly not on the first viewing, which I didn’t even enjoy. As I repeatedly returned to the movie, fascinated and horrified, I think my curiosity grew. Or maybe I was just jealous that my friend got to meet him first. Tommy first made it to my hometown of St. Louis three years ago, and I missed it. Midnight showings of The Room (complete with callbacks and props, practically of Rocky Horror magnitude) had become fairly regular at our Tivoli Theatre, and from then on every time I went I hoped somehow Tommy would magically show up. Then, finally, it happened. Last week I heard Tommy would be there for that weekend’s showings. I grabbed a gaggle of friends, some of whom had never seen the movie, and organized a pilgrimage. I bought a white Tommy t-shirt for the man himself to sign. I got a coffee to get me through the long late-night event. I was ready. He was late. It was past 12:30 when he finally walked down the aisle, to thunderous applause. The audience reacted to him the way one might to foreign royalty: half deferential admiration, half the condescending amazement with which people regard zoo animals. “Oh hai,” he said, to our great delight, just the way he said it in the movie. He told us he was glad to be back in St. Louis. He told us there would be a Q&A before the movie, but first he wanted to show us the pilot episode of his new comedy series, The Neighbors, which is on Hulu. The show played. It was clearly his attempt to capitalize on his reputation for terrible directing, which he has passed off as comedic talent. Tommy’s drunk fans laughed, sad as it was. I stepped out to get that coffee. Tommy was standing at the door I left through, and glared at me sidelong. I turned to my boyfriend, who was with me. “Did you see? 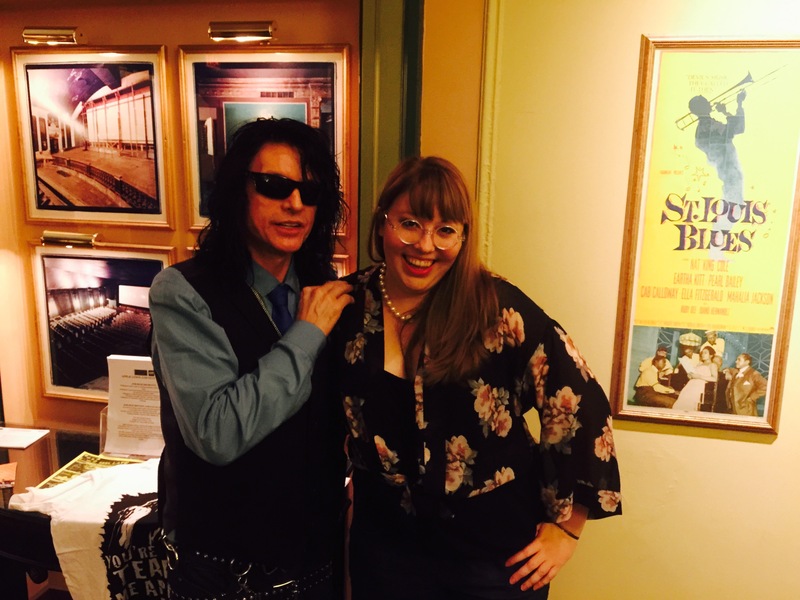 Tommy Wiseau gave me a sidelong look of disgust!” I was thrilled. While in the bathroom, I heard Tommy come out into the lobby and have words with a manager. “Why are they all leaving?” he asked. All bad blood was forgotten for the Q&A, which was glorious. The fans treated Tommy like a god, one of them even asking for writing advice. You have to wonder at what point the kind of hate-love we have for Tommy crosses over into genuine admiration. Tommy compared himself to Clint Eastwood, compared his evil one-dimensional heroine Lisa to Cleopatra (the Liz Taylor version, of course), and refused to answer questions about costar Greg Sestero’s memoir, The Disaster Artist. At fans’ request, Tommy provided a lame freestyle rap, a birthday serenade, and danced (surprisingly well) with one of the girls in the audience. And there were little reminders for us that he’s actually not a good guy. His bizarre monologue about the sensual “power” of women. His reference–and this is true–to Black people as “colored.” We were shocked and appalled, and part of me wishes it hadn’t delighted us quite so much to feel that way. After the Q&A, the movie started rolling, and I snuck out to the lobby again for my big moment. and the date. “I draw a heart here,” he said, and drew a big heart with an arrow through it near the collar. Then I asked if we could take a picture together. He consented, and I handed my phone to one of the guys standing around. This was the fateful moment: Tommy Wiseau and I would put our arms around each other and smile. No matter how famous or loved or hated a person is, you learn something new by touching them. And what I learned about Tommy Wiseau is that he’s human. He seemed thin, light, and fragile, with my arm around his waist. And he was a real person, albeit a slightly off-putting one. Tommy Wiseau didn’t strike me as a particularly good man, but I don’t know him. Perhaps he’s just confused, egotistical, and outdated. For a racist and a misogynist, he has a certain charm. I walked back into the theatre to peals of laughter at the latest punchline in Tommy’s tragic masterpiece. I showed my friends the signed shirt and the picture. I was still delighted, but I also felt unaccountably sad.